I’ve heard that drinking lemon water is good for you, but until about a year ago I had no idea how it would truly benefit my health. I started putting on some weight and was bloated above the belly button and I never had the problem of bloating (or gas) in the past. I thought maybe it was because I was getting older and it was normal. But I also noticed that my tummy would hurt sometimes after eating and it wasn’t just when I was eating something a little unhealthy, it was when I was eating very healthy, clean foods too. I started working with a naturopathic doctor and from a bioenergy test she gave me she noted that I had a sluggish liver and gal bladder. I am going to give you a VERY quick rundown of the liver and gallbladder and what I was lacking. Sluggish means that the organ is overburdened in which it becomes sluggish or slow in performing its regular functions. What causes this? Poor eating habits such as eating junk food high in fat and processed foods. Yes, in my younger days I did eat a lot of processed foods and foods high in fat which in turn, took a toll on my body (if only I knew then what I know now…). Your liver is the hardest working organ in your body and performs every minute of the day to keep you alive! The liver performs a number of critical functions that relate to: digestion, metabolism, hormone production, circulation, nutrient production, immune function, and the processing and elimination of toxins, drugs and metabolic waste products. How does the liver relate to the gallbladder? The gallbladder is a small, pear-shaped sac located between the liver lobes directly under the liver. 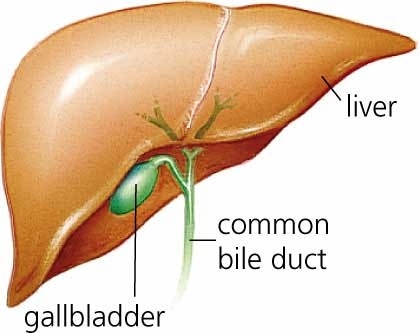 Bile produced by the liver travels through a series of hepatic ducts to a small Y-shaped duct, called the common bile duct, which is connected to the gallbladder and to the small intestine. Excess bile is stored and concentrated in the gall bladder. When you eat fats and they enter the digestive system, a hormone is secreted which causes the gall bladder to contract, releasing the bile into the stomach and small intestine. The bile’s job is help food digestion by working on digested fats. Lecithin in the bile dissolves fat into droplets so tiny that enzymes can surround them and process them so they can pass through the intestinal wall int the blood which takes it to the cells where your body can use it. When too little bile is formed by the liver and when the gall bladder is too “lazy” to empty its contents (due to nutritional deficiencies), the fat cannot be readily absorbed. When fats are not absorbed, it also makes it hard to digest carbs and proteins which disrupts the digestion process. Much of this undigested food is eliminated (when you poop) and because it’s not digested properly, you are not absorbing many vital minerals and vitamins. Even though you may be eating healthy foods, if you are having a problem with bile flow, you may be lacking in many vitamins and minerals which could be causing you to not feel very good – this is what has happened in my case. My hormones were off and I was lacking in Vitamin A. What did I do to help fix this you ask? Well, here is an interesting tidbit of information! Most of our society no longer eats many bitter foods, most people are hooked on sweet and salty foods (thanks to our food industry, but that is a post for another day). Bitter foods are known for stimulating the senses and they help engage the digestive system. When consumed, bitter plants and drinks naturally stimulate the production of saliva, gastric juices and bile to balance the appetite and prime digestion. Now, I’m not a doctor, but in my studies i have learned this drink that I am now doing every day can help increase bile flow. This is not a fix for all, and if you have any health concerns, please talk with your doctor. Lemons contain Vitamin C and potassium. This is a great little immune boost as well as good for the adrenals which can potentially help reduce the affects of stress. They can also lead to clearer skin since Vitamin C is needed for collagen production. Honey is known for its anti-inflammatory properties in addition to being full of nutrients. Most people know it to be great to naturally fight allergies. Taking just a teaspoon of local raw honey each day can boost your immune system by helping build a tolerance to local pollen. Studies have shown that cinnamon in combination with honey benefits lipid profile, liver enzymes, insulin resistance, and high-sensitivity C-reactive protein in diabetics and people with non-alcoholic fatty liver disease patients. Some suggest that the insulin boosting power of cinnamon can counteract the glucose elevation in honey which would make the honey/cinnamon mixture a low glycemic index food! The list actually goes on and on with health benefits, but I thought a few would be good food for thought. If those benefits don’t convince you, look up more facts yourself, or better yet, give the daily drink a try for a couple weeks and check it out for yourself! If you are interested in learning more and working with me to find out what might be going on with you, or, how you can further help your liver and gall bladder, email me at Results@JenniferCabic.com for a FREE consultation. I would love to help you out! Again, if you have any health concerns or known allergies to any of the ingredients, please consult with your family physician before trying anything new. 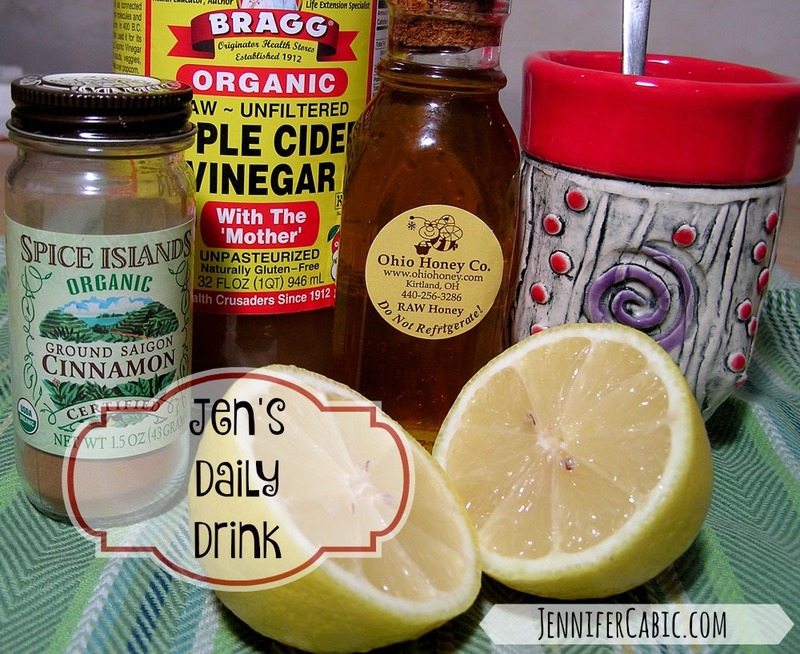 Jen, could I use lemon essential oil if I don’t have lemons on hand? Lori, yes, you could use lemon essential oil (make sure it is a trusted brand for ingestion), it will give you different benefits since the oils comes from the peel, but you will not get the Vitamin C and other nutrients like you would a fresh lemon. The essential oil is very detoxifying for the body. If you have lemon essential oil and fresh lemons, that would be a great combo!